Divinations by Storm De Hirsch (1964). Divinations was completed in 1964 at the same time Storm De Hirsch was finishing her only feature film, Goodbye in the Mirror. According to the Film-makers’ Cooperative Catalogue No. 4, published in 1967, the music making up the film’s soundtrack is a ritual chant of a Maori medicine man and a Sicilian tarantella performed on a jew’s harp. 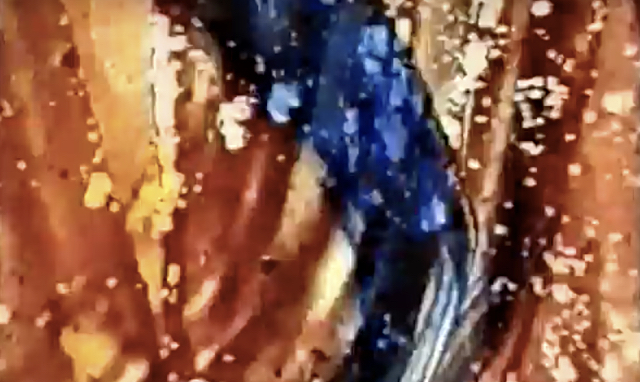 A film poem that records a psychic event in color, shape and sound. The inner eye reveals its visionary powers through a series of mystical signs and symbols, a collage of negative and positive images, incantations and sorcery. I wanted badly to make an animated short and had no camera available. I did have some old, unused film stock and several rolls of 16 mm. sound tape. So I used that — plus a variety of discarded surgical instruments and the sharp edge of a screwdriver — by cutting, etching, and painting directly on both film and tape. In addition to single rentals of Divinations from the Film-makers’ Cooperative, De Hirsch offered the film as a trilogy with her two later films Peyote Queen (1965) and Shaman, A Tapestry for Sorcerers (1966). She named the trilogy The Color of Ritual, The Color of Thought. The film is still available to rent through the Film-makers’ Cooperative. The film has two title cards. The opening title card just says Divinations; and the end card reads By Storm De Hirsch.